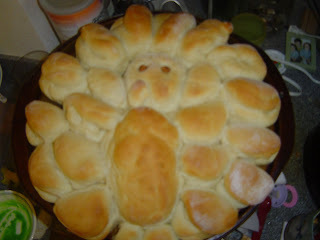 I came across this idea for turkey rolls via Be Different Act Normal. We went over to a friend's house to make pie and rolls the day before Thanksgiving...but with the kids running into nap time, we only got the pies done. I said I'd just pick some up on the way home, but Boy was asleep by then, so we just drove home. I went out to get groceries and planned to buy rolls, rather than make a mess of my kitchen while I'm trying to pack. I got to the store, though, and stood in front of the rolls looking at the price. I just couldn't bring myself to buy them, knowing Patti's Famous Dinner Rolls would taste better, and I had a whole pantry full of ingredients that I don't want to move...so I made rolls. 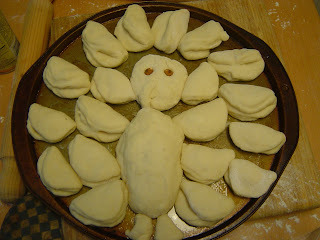 Here's our turkey before the second rise. We used almonds for the eyes. 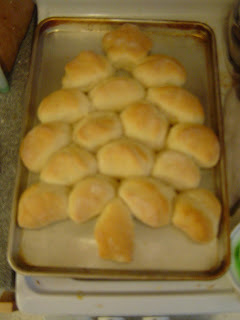 We always make at least a double batch because these rolls are SOOO good. 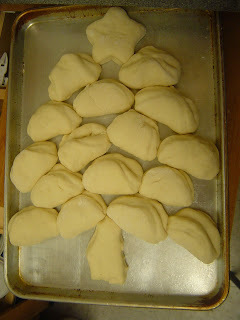 Since we still had plenty of dough left and this is too late to inspire anyone for Thanksgiving, I thought we would try a Christmas tree too. 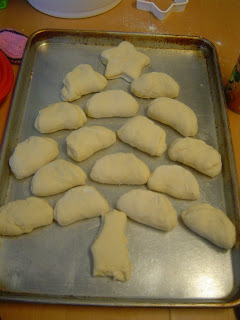 I rolled the dough extra think to cut out the star, since that part wouldn't be folded. They took a couple extra minutes to cook (but then just about everything does in my oven.) since they were all crammed together. This is how they looked after they came out. 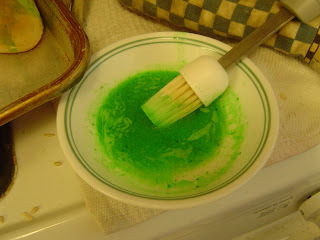 I decided to experiment with coloring them, so I added some green Wilton paste to some melted butter. (It didn't mix super well...it must be water solable.) I brushed the on the tree, leaving the star and trunk plain. I can't decide whichI like better...plain or colored...what do you think? I was going to try to sneak and do it without the kiddos help...but this blog is supposed to be about being more patient with my helping little hands...so they got to help and we had a pretty good go of it. 1 Tablespoon yeast and let it dissolve. Knead until flour is mixed in well. Add flour as needed to control stickiness. Set in warm place and let rise until it doubles in size. Roll out to 3/8 or 1/2 inch thickness. Cut with the top of a cup or glass. 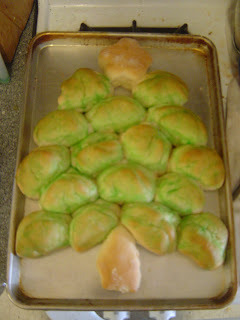 Fold in half and place on lightly greased cookie sheet. Set in warm place and let rise until double in size. Bake for about 10 minutes and 375. Brush tops with butter while still hot. Makes 20 rolls. The Christmas tree is nice, but I really really really like the Turkey Rolls! I agree. Both are fantastic! But the turkey rolls warm my heart. :) Good Job! Your rolls look so cute. I like the tree idea too. Maybe I'll try that this Christmas. Thanks for leaving a comment on my blog to let me know you tried it. Did I just call you Patti? I'm SOOO sorry. I better get some sleep. Please link it up to my Thanksgiving link up!http://www.jdaniel4smom.com/2011/11/thanksgiving-traditions-link-up.html in the traditions section. 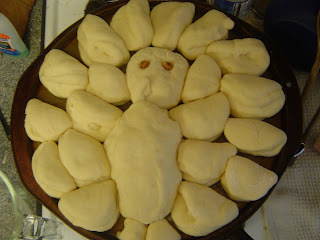 You should know that this will be the 3rd year in a row that I bring your turkey made of dinner rolls to my mom's house for Thanksgiving :) Thank you so much for the idea!